Vista IT Group, a thirty-year-old national technology provider and systems integrator announced today it was named a partner in Hewlett Packard Enterprise’s (HPE) strategic Replacement Parts Business (RPB) program. Part of Hewlett Packard Enterprise Technology Services (TS) Business Unit, the RPB program supports a network of HPE Authorized Parts Resellers who lead the marketing and sales efforts of Certified HPE Genuine Replacement Parts in the North American business partner and end-user eco system. The HPE spares program is intended to provide more immediate access to genuine, high-quality, manufacturer-warranted spare parts. This is achieved by concentrating distribution efforts through a select group of business partners for the most common components in HPE’s industry standard ProLiant servers and networking product lines. 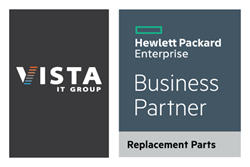 To learn more about Vista IT Group, or the replacement parts program, please visit the Hewlett Packard Enterprise parts store (https://parts.hpe.com/hpparts/Part_Resellers.aspx), or contact Vista IT Group on the web or by calling 888.870.8847. Vista IT Group is one of the largest and most established technology providers in the country. Since 1986, we have been serving customers through core competencies in Data Center, Supply Chain and Technology Services. Uniquely equipped with certified engineers, warehouse facilities, and logistics expertise, our business model can quickly respond to the ever-changing technology needs of our customers. Vista IT provides a broad range of programs and professional services to help integrate strategies around our customers’ information technology, data, and lifecycle management needs. The Hewlett Packard Enterprise Replacement Parts Business (RPB) is part of HPE’s Technology Services division which is a business unit within the newly formed Hewlett Packard Enterprise. HPE Technology Services provides IT design, planning, implementation, integration and maintenance services and support for organizations and government agencies. The group also offers business and technology consulting services.